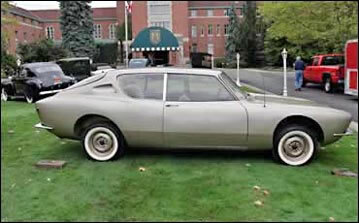 Prototypes produced by Studebaker were based on the Avanti design. 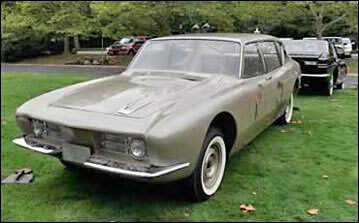 For a brief time in the early 1960's Studebaker had hopes that the well-received, but limited production Avanti would save the company from certain financial ruin. Even the Avanti couldn't make that dream come true, but several sedan and four door designs were built using Avanti body panels. These prototypes are proof of how powerful an influence the Avanti had on corporate design strategy at the time. If Studebaker's entire line of vehicles had been transformed into Avanti variations, would this new fleet of cars have saved Studebaker? 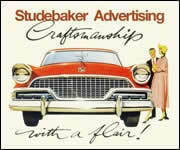 Probably not since competitive design was only one of Studebaker's problems. For many years the prototypes were kept in warehouses and were almost forgotten. Today some of them are on exhibit at the Studebaker National Museum in South Bend, Indiana. 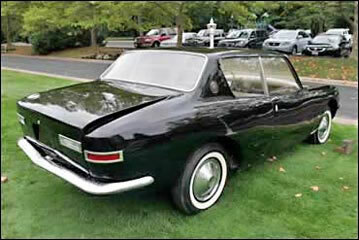 A side view of one of the Studebaker prototypes. 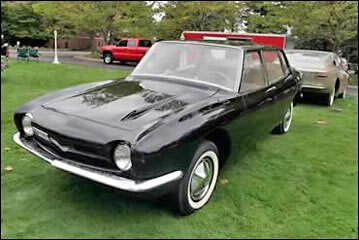 Front view of a Studebaker prototype. Rear view of Avanti inspired prototype on display. Front view of Avanti inspired prototype on display.